SINGAPORE, Nov. 15 (Yonhap) — South Korean President Moon Jae-in said Thursday he hopes North Korea will participate in various meetings with Southeast Asian nations after carrying out complete denuclearization. 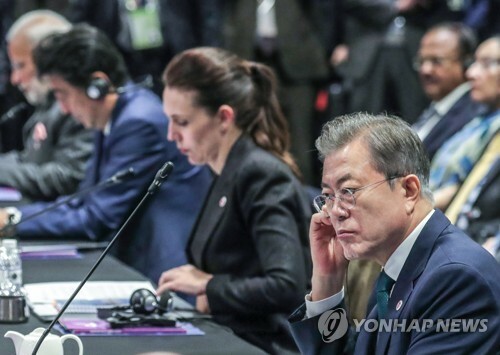 Moon made the remark during this year’s meeting of the East Asia Summit (EAS) in Singapore, calling for continued support from EAS member nations for his drive to realize denuclearization and lasting peace on the Korean Peninsula. “I anticipate North Korea will sincerely carry out complete denuclearization and take part in various ASEAN meetings,” Moon told the meeting, referring to the 10-nation Association of Southeast Asian Nations (ASEAN). The remark came a day after Moon said during a Korea-ASEAN summit that he will actively consider inviting North Korean leader Kim Jong-un to a special summit that South Korea plans to host for Southeast Asian nations next year. Since last year’s EAS meeting, “miraculous changes” have happened on the Korean Peninsula, Moon said of the peace process with North Korea that led to three inter-Korean summits, the historic summit between the U.S. and the North and other reconciliation measures. “North Korea’s denuclearization measures are continuing as well,” Moon said, adding that the North’s dismantlement of its nuclear testing site, a promise to demolish its long-range missile launch site and an offer to shut down its main nuclear complex in return for corresponding measures from the U.S.